iPad sales vs. Mac portable sales. Wow. Apple recently announced yet another quarterly result filled with all manner of shocking metrics including a whopping 17 million iPads sold. That's astonishing by itself, though frankly the sales numbers have been so astonishing for so long that I've ceased highlighting every single milestone (one recent favorite: the iPad has 68% of the entire tablet market). One relative sales point jumped out at me in the chart above, compiled by Stuart Carlton in a a post here. 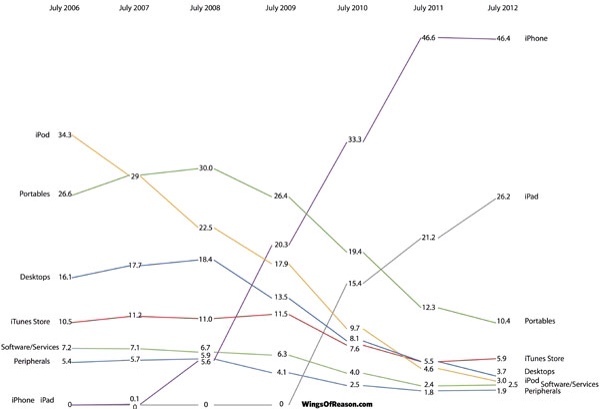 It shows the % of revenues contributed to Apple, over time, by product type. The lines that jumped out at me are those for Portables and iPads. Since the release of the OG iPad, as you can see the lines are almost mirror images of each other. Kind of neat. Obviously, as these lines represent relative contribution to revenues, they don't say that Apple portable sales are shrinking (in fact far from it – they have consistently outgrown sales in the PC industry as a whole). What they do say simply is that iPad sales growth is exploding at a far faster rate, making iPads waaaaaaaay more important to Apple than all other products save the iPhone. Further, I have nothing (but my eyes!) to document the idea that iPads are cannibalizing MBP/MBA sales, though Tim Cook has mentioned it as a general effect. Conventional wisdom has it that iPads are massively cannibalizing PC laptop sales, and effectively sounded the death knell to netbooks. One thing is clear in any case: in a relatively short period of time the iPad has risen to become an unbelievably dominant, important product. A true world changer. This entry was posted in Hardware, iOS, Musings, News and tagged Hardware, iOS, iOS iPad as sole only computer, iPad alone, iPad primary computer, ipad sales, New iPad, notebook sales, sales. Bookmark the permalink.